Take it easy with Evelyn! Evelyn has a finish of lovely, stitched floral detailing. Evelyn is flexible, light, and easy to slide on and off. 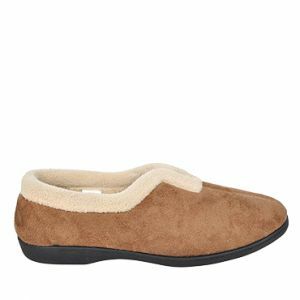 This cosy slipper has soft faux wool on the innersole and around the ankle. With a slightly padded sole, Evelyn is built for supreme comfort, and perfect for wearing around the house. Love the look? Try Carmen for another great style!